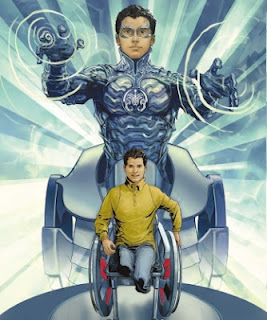 NEW DELHI, India - Liquid Comics and the Open Hands Initiative, a U.S.-based nonprofit dedicated to public diplomacy efforts, on April 25 announced the launch of the Silver Scorpion animated Web series on MTV Voices. Billed as the world's first disabled superhero, the wheelchair-bound Silver Scorpion is the brainchild of a group of 26 American and Syrian youths with disabilities who convened for a Youth Ability Summit in Damascus over a year ago. The Silver Scorpion will come to life on the web in an animated 4-part series on the MTV Voices global websites targeting the youth in Europe, Latin America, Africa and Asia. “This project is unique in the way it empowered students from across the world to be the architects of a new superhero that embodies their worldviews and the role models they would like to see. MTV Voices is the perfect platform to share their character with the world,” added Liquid Comics co-founder and CEO Sharad Devarajan. “MTV Voices is all about giving young people a platform to express ideas, aspirations, concerns about the world in a creative manner”, said Viacom International Media Networks VP of social responsibility, John Jackson. The Silver Scorpion Web series on MTV Voices will also be promoted globally through iEARN (International Education and Resource Network), which reaches 45,000 schools and youth organizations in over 130 countries. 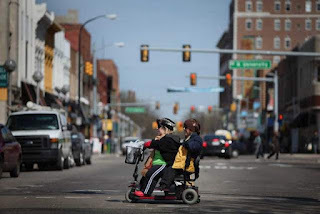 ALBANY — In a bid to cut down on cases of abuse, the state on Monday will begin monitoring security cameras in public vehicles used to transport people with developmental disabilities, the Daily News has learned. The cameras, along with Global Positioning Systems, will be installed Monday in state buses, vans and cars used to transport the developmentally disabled in the Albany area. The reform is part of a pilot project that officials hope to expand statewide within a month. Courtney Burke, commissioner of the state Office of People With Developmental Disabilities, said in a statement the program will make the system safer while individuals are being transported. And she said it will also help resolve complaints, preserve evidence in cases of abuse and even help clear workers who are falsely accused of abuse. Burke’s agency and others like it that provide services to vulnerable populations have been hit hard recently by reports of abuse and coverups of wrongdoing. There are no plans at this point to expand the security camera program to group homes run by the state and private companies. He is pushing for passage of legislation that would require cameras to be installed in common areas of all group homes for the developmentally disabled, as well as in public and private transport buses, cars and vans. “There’s an overwhelming strategy on the state’s part that they don’t want the evidence of abuse,” he said of the push for more surveillance cameras. Putting cameras in state transport vehicles is just one step the Office of People With Developmental Disabilities is taking to crack down on abuse. It will outline its approach in a report expected to be released this week. As part of its reforms, the agency reduced voluntary overtime by 43% since November, after limits were placed on the number of consecutive hours and days an employee can work, Proulx said. A brave Cork girl will address the United Nations in New York on Monday on how technology has changed her life. Joanne O’Riordan was born 15 years ago with no limbs but now leads a very active life thanks to technology. She is to address an ITU conference at the United Nations when she will deliver a keynote speech how technology has helped her advance her life through both education and the social environment around her. Joanne is the only person with a disability invited to the exclusive conference entitled ‘Girls in Technology’. The Irish Sun newspaper reports that Joanne is a ‘whiz on a computer, uses her iPhone like a tekkie, excels in school and drives her wheelchair like F1 champion Sebastian Vettel’. The Millstreet native plans to take the conference – and the 300 delegates – by storm. She told the paper: “I have never been to America so I am really looking forward to this trip. Joanne has Total Amelia, a condition which affects fewer than a dozen people worldwide. Proud mum Ann said: “Joanne is a typical example of why everyone is entitled to a chance in life and she makes up for her lack of limbs in other ways. At the conference, Joanne will address some of the technology world’s leading female decision makers and hopes her speech will empower others to realise the importance of technology in their lives. Joanne’s brother Steven is producing a documentary on his sister’s extraordinary life. He has received funding from the Irish film board for the movie entitled ‘No Limbs No Limits’. Steven and Joanne hope the work will highlight the ‘positive and lasting effect on how people perceive those with disabilities in Ireland and beyond’. He has already made a film entitled ‘The Forgotten Maggies’, a documentary charting the human rights issues surrounding the Magdalene Laundries. Lydia Graber (pictured) pulls on a lime green T-shirt that says, "This is what a disability looks like." She hops on a miniature electronic scooter and circles the perimeter of about 50 disability activists, who have gathered on this bright spring day on the Diag at the University of Michigan in Ann Arbor. Graber was born with pseudoachondroplasia, a form of dwarfism characterized by disproportionately short arms and legs. She stands 3 feet, 11 inches, and needs the scooter to get around because she has joint problems. Graber, who has had about 20 surgeries, has had both hips replaced, both knees replaced and is awaiting surgery on her ankles. The joint problems, which are common with her form of dwarfism, might be the only thing she doesn't like about being a Little Person. A song by the Isley Brothers begins to play, and a flash mob starts to dance. "You know you make me wanna -- SHOUT! Kick my heels up and -- SHOUT! Throw my hands up and -- SHOUT!" "This is right up my alley, dancing!" shouts Graber, 61, of Sumpter Township. Graber hops off the scooter, forgetting the pain in her joints, and dances into the center of the crowd. Graber has always been comfortable at the center of attention. A former actress, she was an Ewok in "Star Wars Episode VI: Return of the Jedi." And the music goes silent for a beat. This flash mob is incredibly important to Graber. She has worked on disability issues at all levels, serving on national organizations, with corporations and state government. But this is just as important to her, being in public, being seen and being heard, and celebrating her uniqueness. She wants to educate people about dwarfism. She says that is the secret to breaking stereotypes, showing everyone that people with disabilities are no different than anyone else. When the music ends, Graber screams: "That was fun!" The group of activists gathers for a photo. "Hold your guts in," Graber says, and everybody laughs. Graber has always been quick with a joke. She once worked in improvisational comedy in Los Angeles. As the photo is taken, Graber and several other people, who represent several different types of disabilities, yell in unison: "This is what a disability looks like!" There is a strong and ironic message in that single statement, coming from all the different voices blending together. Because there is no single face to disability. And there is no single way to characterize Lydia Graber. She is an activist, a loving wife, a retired bank executive, a comedian and a ball of energy who never stops moving. "While working with kids with disabilities or adults with disabilities," Graber says, "I tell them, 'We are individual people. We are special people. All of us. Because you are different, you are going to stand out to people. Depending on how you approach life, on how you approach people, you can make it work to your advantage.' "
And that is the secret behind Lydia Graber; her strength is the very thing that others view as her weakness. "I have been blessed," she says. Graber was born and raised in northwest Detroit. Both her parents and two older sisters are average size. "Lydia was never treated any differently," says her sister, Gail Moine, 62, of Clawson. "We were raised the same. My parents taught us, 'Yes you can.' "
Graber was born bowlegged. "The doctors told my mom that I'd be in a wheelchair at 25," she says. "But we proved them wrong." When Graber turned 22, she packed up her 1970 Plymouth Duster and took off for California, where she lived for 14 years. She endured discrimination at almost every turn. She said that she applied for one job and that "I was told that I was too short and they weren't going to hire me. This was before the Americans with Disabilities Act. There wasn't too much recourse." At another job, she wasn't promoted. "They said that if I sat at a podium, I could fall off a stool and hurt myself," Graber says. "You can let people take advantage of you because of your size, or you can speak up." Graber eventually got a job at Bank of America, and slowly climbed the corporate ladder. Eventually, she became a vice president of mortgage services. She is now retired. While living in California, Graber made extra money working in television and movies.While shooting "Return of the Jedi," Graber was on location five weeks and earned $4,000 or $5,000. Graber, who worked under the name Lydia Green, is one of 68 Ewoks listed in the movie credits. She remembers the Ewok costumes as being hot. "The Ewoks looked like little teddy bears," Graber says. Graber says she can spot herself in the movie: "You can pick me out because I was the only Ewok on a glider. I got shot down. The other scene was with Chewbacca with two Ewoks. We went to the chicken walker and I had a club and beat up the storm troopers and threw them out. Chewbacca was sitting on the right side, there was an Ewok driving and I was standing in the middle." Graber met her husband, Marvin Graber, at a Little Person convention in Nashville, Tenn.
"When I met her, she stood out in a crowd," says Marvin Graber, who stands 4 feet, 7 inches. "Everybody there was a Little Person, but she was the center of attention." Lydia and Marvin Graber married in 1988 but did not have children because of her medical problems. "She did not feel that was a good idea," says Marvin Graber, who has cartilage-hair hypoplasia, another form of dwarfism. Lydia Graber and her husband have opposite personalities. She is outgoing and he is more reserved. "I can't walk up to somebody and start talking like she can," says Marvin Graber, who works at Ford Motor as a parts distribution dispatcher based in Brownstown Township. Their house has been modified to accommodate their size. The sinks and counters were lowered to make it easier for both of them. Lydia Graber drives a van with pedal extensions. "I feel very fortunate to be married to her," Marvin Graber says. In 1993, Gov. John Engler appointed Lydia Graber to the Michigan Commission on Disability Concerns. She served for 10 years, eventually chairing the commission, which represents the concerns of Michigan's 1.9 million people with disabilities. "More importantly, she has a great mental attitude. She is infectious. The way she goes about her life is inspiring." In 2002, Graber was appointed to serve as a member of the Northwest Airlines Consumer Advisory Board for travelers with disabilities. After Delta acquired Northwest, Graber moved to the advisory board there, where she chairs the training and compliance committee. "We help Delta with how to treat people with respect and dignity," Graber says. "We want them to realize that people with disabilities have money and travel. They shouldn't be treated like second-class citizens." David S. Martin, the disabilities program manager at Delta, describes Graber as "one of the most unique and authentic people I know. She'll challenge you, make you think and then make you laugh." Graber tries to educate people about Little People every chance she gets. After all these years, she knows when people are staring at her, or talking about her. Graber will be walking through a mall or a store and hear a little kid: "Mommy, Mommy, look." But the child's mother will be busy looking at a clothes rack. Then the mom will turn and look at Graber. "Usually, the parents get very embarrassed and try to apologize and drag them away," Graber said. "I've seen them slap them upside the head." Graber will try to stop the mother and child. "No, that's OK," she will say to the child, "You can ask me any question you want." Usually, the children ask: "Why are you so little?" "That's the way God made me," she'll say. "You know how some people have blue eyes and some people have brown eyes and some people are tall and some people are short? Well, that's kind of like me." "If a child says something like 'midget,' I'll correct them and say, 'Midget is not a nice word. We are called Little People.' "
She loves being a Little Person. But more than anything, she loves making people laugh. She tries to use humor to crack through that barrier and make everybody see her as a person, not as someone facing a disability. "My approach has always been to use my sense of humor," she says, "and make them feel comfortable." Disability activists blocked one of central London's busiest road junctions on April 18 with a line of wheelchair users chaining themselves together in the latest in a series of direct action protests against welfare cuts. The protesters used metal chains and security locks to block two junctions around Trafalgar Square bringing traffic to a standstill for more than two hours. 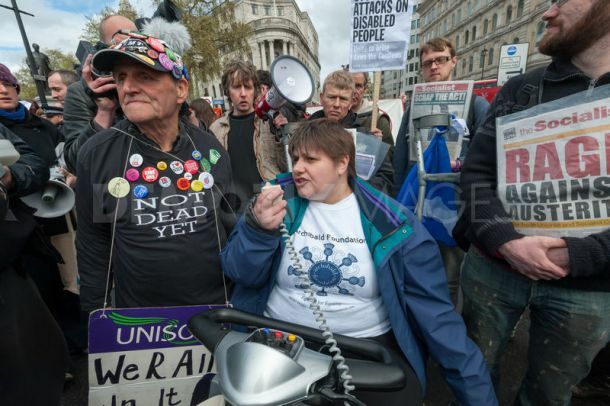 The demonstration was organised by Disabled People Against the Cuts (Dpac) which has taken the lead in several direct action anti-cuts protests over the past two months. "We are fed up with being vilified as scroungers by successive governments," said Dpac co-founder Debbie Jolly, from Leicester. "We are sick of hearing about disabled people who have died from neglect and lack of services or who have committed suicide because services and benefits were withdrawn from them. We want to make sure politicians know we will not accept these attacks on our lives any longer." Planned cuts to the Disability Living Allowance could see 500,000 disabled people losing money, the charity Mencap has said. "It has been great," said Adam Lotum, 49, a father who recently lost his Disability Living Allowance due to the cuts. "People are talking about the issue now and we hope that that message is getting through to government – the message that they have picked on the wrong group – we are not going to stand for it any longer." Lotum said that since the welfare reforms, government ministers had given the impression that disabled people were "scroungers or work-shy", and that had led to growing hostility in the street. "Many times I have been at a road crossing waiting for a traffic light and I have been pushed into the path of oncoming traffic. I've had doors shut in my face when I am using my walking-stick, I've had it kicked away from me. People have sworn at me, accused me of being a fraudster and a criminal and accused me of taking money away from them." Lotum, from Reading, said he wanted the government to realise the impact the cuts were having on ordinary people. "What I would like to achieve from this protest is to see the government and all interested parties talking to real people on the street and in their homes. Finding out how they are being affected by the cuts, how their lives have changed and how they are being discriminated against." from USA Today. 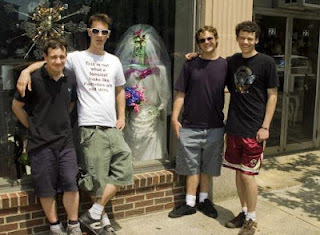 Pictured are the four members of Asperger's Are Us, from left to right: Ethan Finlan, Noah Britton, "New" Michael Ingemi, and Jack Hanke. Jack Hanke, 18, arrived at rehearsal wearing a giant sombrero and green kimono. Noah Britton, 29, took off his pants mid-practice, explaining that they still stank from last night's concert. He ran through the rest of his comedy troupe's practice wearing boxers, and the group's signature T-shirt, which reads: "I don't want your pity." Britton, Hanke and the other two members of Asperger's Are Us don't care who thinks they're weird. Or even funny. They think they're hilarious. And if others don't, who's the one with the disability? Many traits the public has long found engaging or amusing have their roots — perhaps surprisingly — in Asperger's. The absurdity of Monty Python, the flat demeanor of Star Trek's Mr. Spock and the awkwardness of Andy Kaufman, are all common Aspergian traits. Dr. Sheldon Cooper on Big Bang Theory gets laughs for those characteristics, too. "In the last few years, Asperger's has become recognized as a foundation for some elements of comedy," said John Elder Robison, a nationally renowned Asperger's advocate, and author of Be Different. "All of a sudden there is a broad public awareness that the reason for behavioral differences in those characters would probably be called Asperger's." That growing recognition helps groups such as the Boston-based Asperger's Are Us, which is getting gigs right now because it's Autism Awareness Month. They're grateful for that, but as their shirts suggest, the men aren't seeking compassion. "We'd much rather (the audience) appreciate us as comedians than as people who've overcome adversity," said Britton, the group's informal leader since he was the others' camp counselor seven summers ago. Asperger's, which is defined by social awkwardness and repetitive behaviors, is part of the broader "Autism Spectrum," of related disorders. Members of Asperger's Are Us revel in absurdist humor, like Kaufman's and Monty Python's. Some of their own jokes get laughs because their delivery is so dead-pan, some because they offer insights into male adolescence, and some because they're just plain wacky, like a skit in which one member says another has gotten him pregnant and the other replies, "You can't be pregnant, I'm bubble-wrap." There's been little academic research on what makes people laugh, and virtually none on the connection between autism and humor, several scientists said. And maybe that doesn't matter. "You don't want to rely on academics to tell you whether something is funny," said Simon Baron-Cohen, a leading autism researcher in England and cousin to comedian Sacha Baron Cohen. "Ultimately you want to look at the audience response." The group's biggest show, held last summer in an old movie theater, was received with a standing ovation. Several audience members described the group's humor as "fresh," and "raw." In person, group members toss off endless puns and bathroom jokes, cracking one another up. They still laugh at the same gags they thought up as campers. One benefit of Asperger's, they say, is that they appreciate a joke just as much the 40th time as the first. They rib one another about the obsessions, or perseverations, common to people with Asperger's. One skit lampoons 19-year-old group member Ethan Finlan's obsession with train schedules. 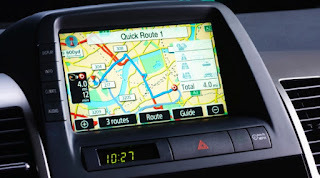 That transportation expertise comes in handy, though, when planning group rehearsals, they said, and other Aspergian obsessions can be useful, too. Britton's passion for psychology propelled him through a master's degree and into a teaching position at a local community college. "We're just differently assembled," Hanke responds. Obviously, not everyone with autism has this group's quick wit and urge to perform. Many on the spectrum can't speak; others struggle to hold a simple conversation. June Groden, who runs a Rhode Island network of autism services, recently began training students in conventional humor, to help them fit in better socially. Young children learn to be "goofier" by singing silly songs. Older students practice delivering jokes, learning to appreciate when others laugh with them. "We want these kids to try and learn at least some mainstream humor and get something out of it," she said. Britton, appointed last month to the federal Interagency Autism Coordinating Committee, a Congressionally mandated advisory group, says he has a much easier time sharing jokes with others on the spectrum than with "neurotypicals." When people ask Britton to describe the purpose of his comedy troupe, he knows they're expecting him to say something like "raise awareness about autism." Instead, he once responded: "We want to sail a flotilla to Spain. We've been building all these boats and we just want to get out there." Gently massaging the soft flesh under his knees, 20-year-old Abdul Ahmat recalls the suicide bomb six months ago that destroyed his legs. The former construction worker, in a wheelchair after his legs were amputated, is among a growing number of Afghans severely wounded by bombs that have grown grimly more powerful than ever before in three decades of conflict. "I stepped onto the street to head to work, when suddenly I became helpless. 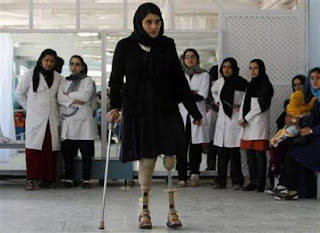 I knew I had lost my legs," the father of one said of the attack that killed 13 foreign troops and four Afghans in the capital, Kabul, in October 2011. Ahmat, who had come to Kabul from relatively peaceful Bamiyan province in search of work, spoke in a Red Cross orthopedic centre, one of the largest in the world and one of seven the humanitarian organization operates in Afghanistan. The free-of-charge centers log some 6,000 new patients every year, all of them Afghans. Of those, 1,000 are direct victims of war, many grievously wounded by the heightened potency of bombs. "I can't say that the number of Afghan bomb victims is increasing, but the power of the blasts certainly is," said Alberto Cairo, an Italian physiotherapist in charge of the orthopedic centers. He started his work in Kabul in 1990. Bombs have changed over the course of the war, experts say, evolving from crude affairs using cheap explosives packed with nails and other bits of metal into relatively more sophisticated devices using fertilizers imported from Pakistan. Military officials, who did not wish to be identified, said the Taliban are now increasing the chance of infection among victims by covering bombs with urine, feces or blood, leading to an increased likelihood of amputation. No statistics exist for Afghan amputees, but the victims of more powerful bombs are yet another example of civilians who have borne the brunt of a war becoming even more dangerous as foreign combat troops prepare to withdraw by the end of 2014. Civilian deaths in Afghanistan were up for a fifth straight year in 2011, according to the United Nations, with more than 3,000 killed last year alone. The vast majority were killed by insurgents. In its report, the United Nations said bombs - also known as improvised explosive devices, or IEDs - planted on roads and increasingly deadly suicide attacks that targeted civilians killed more people than any other form of attack. "It is really devastating what bombs can now do. In the past we had a few double amputee patients, now we see quite a lot," Cairo told Reuters as he tended to a middle-aged IED victim trying out a new pair of prosthetic legs. The difference between old and new bombs in the orthopedic centre is stark: most of the one-legged men are grey-haired and wearing turbans, many victims of Soviet mines during the war with Moscow in the 1980s. T-shirt clad younger patients, such as one man in his twenties who lost both legs above the knees in December's suicide attack, appear to have suffered graver injuries. Almost all of the Kabul centre's 323 members of staff are themselves disabled from war or disease, something which the Red Cross says helps boost patient morale. Other patients include children suffering from congenital diseases. The Kabul centre also has an on-site factory, where disabled workers turn out custom-made artificial legs and arms from individual moulds. Civilians are not the only victims of increasingly powerful bombs that are also believed responsible for more amputations among U.S. troops. NATO forces fighting the Taliban say IEDs are the insurgents' deadliest weapon. Those who disarm the bombs are considered to have the most dangerous jobs in the increasingly unpopular war, which has dragged into its eleventh year. Last year a record number of American soldiers needed amputations, with the number reaching 20 a month, outpacing even the most violent years of the war in Iraq, U.S. reports say. Smaller IEDs are also being made, again usually from fertilizer smuggled from Pakistan, aimed at passers-by. For 11-year-old Norzia, the fear of IEDs is very real. The daughter of a shepherd was hit by a Soviet-era landmine when tending to her family's sheep in eastern Wardak province. Her pretty face framed by a colorful hijab, she gingerly walked on artificial legs towards her physiotherapist, who guided her with a slight limp. "I want our government to stop the war in our country, I want the Taliban to stop planting roadside bombs. This is what can happen," she said. The history of the Paralympic Games is to be told in a BBC Two drama starring Rob Brydon and Eddie Marsan. Best of Men will tell the story of a neurological doctor whose work with wounded soldiers led to the first official Paralympics in Rome in 1960. Writer Lucy Gannon said Dr Ludwig Guttmann "revolutionised life for paralysed people". 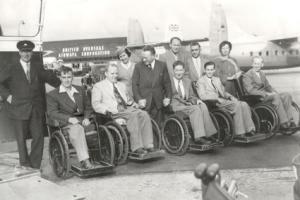 The first unofficial games for disabled people was at Stoke Mandeville Hospital. German-born Dr Guttmann, who had been using sport as a therapy to rebuild strength on his patients, opened the games on the same day as the 1948 Olympics. In the drama Brydon will play a paralysed soldier, who is admitted to Stoke Mandeville under the care of Dr Guttmann, who will be played by Marsan. Now referred to as the 1948 International Wheelchair Games, it became an international event in 1952, when a team from Holland went to England to participate. By 1960, the games were held in parallel with the Olympics in Rome. Gannon said she found Dr Guttmann's story "amazing", calling him "an unsung hero". Ben Stephenson, controller BBC Drama Commissioning, said: "Lucy Gannon has written a moving human story that reveals the largely unknown history behind the birth of the Paralympic Games." from The Arizona Republic. 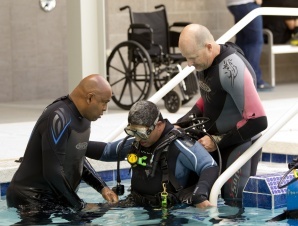 In the picture, Edward James (left) and Duane Blau (right) help disabled Air Force veteran Keenan Lee, of Mesa, into the pool at Virginia G. Piper Sports & Fitness Center in Phoenix. At age 14, Nick Springer was hiking the Appalachian Trail when he came down with a bout of meningitis that left him a quadruple amputee. But that hasn't deterred him from participating in sports. Now a world-class athlete, the Phoenix resident is a member of the U.S. National Wheelchair Rugby Team, which will compete in the 2012 Paralympic Games in London. The games run Aug. 29 to Sept. 9, soon after the Olympics and in the same venue. The rugby team won the gold medal in the 2008 Paralympics in Beijing. "Getting into disabled sports is one of the big things that pulled me through," Springer said. "It helps with quality of life." He is a regular at the Virginia G. Piper Sports & Fitness Center for Persons with Disabilities at 5031 E. Washington St. in Phoenix, which opened last fall. The center, a program of the non-profit Arizona Bridge to Independent Living, covers 45,000 square feet and is the first of its kind in the western United States. It has a basketball court, indoor track, 50 pieces of fitness/training equipment and a 40-foot rock-climbing wall donated by the Arizona Sports and Tourism Authority. The center also has a therapy pool, lap pool and whirlpool with elevators, chair lifts and ramps. "Quite a bit of effort went into making sure every piece of adaptive equipment was built in," spokesman Loren Worthington said. On the basketball court, the hoops can be raised or lowered for those in wheelchairs. Overlooking the basketball court is a one-tenth-mile walking track with a low-impact surface to make walking easier for people with joint or bone ailments, and the track surface promotes friction, helpful in allowing leg prostheses to get a good grip. Overlooking the court is a clear railing so people can sit in wheelchairs and watch the action. The railing is equipped with electrical outlets to accommodate people on ventilators. Other programs at the center include yoga, nutrition education, adaptive rowing and power soccer. Springer said participating in athletics gives him a goal, a benefit for a lot of people. "Kids with new injuries ... want to strive and do better at sports. It helps with rehabilitation, gives them a better attitude and makes for a stronger body," he said. Another advantage of the center, he said, is getting out and meeting others in wheelchairs. "If they see this guy who's successful in work, has his own family and can go hang out with friends, it gives a different outlook," he said. "It gives guys who maybe are newly injured ... an opportunity to work out on their own terms and be around other guys in wheelchairs. That's what great about it." The center hosted a scuba-diving, rock-climbing and rugby event Saturday for disabled veterans, among them Keenan Lee of Mesa, a retired Air Force captain, pilot and veteran of Operation Desert Storm. 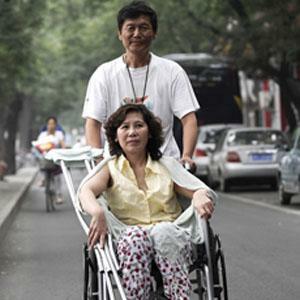 He suffered work-related injuries that left him in a wheelchair and in constant pain. One thing he used to love was scuba diving -- he's certified -- and he had the opportunity to return to it Saturday at the center. "I appreciate how they're supporting the troops and giving us a better way of doing things like scuba diving," Lee said. "I haven't done that lately because of my injuries." One of the regulars at the center is Cory Hahn, who was playing baseball for Arizona State University last year when he injured his spine in a dive for second base, leaving him paralyzed from midchest to his toes. "This place is a huge plus," he said. "Coming back to school in Arizona, the big question was a place to work out. This is 10 minutes from campus." Not only is he strengthening muscles and improving skills at independent living, he said, he likes the center's supportive atmosphere. "It has a positive vibe," he said. "Everybody here has some sort of injury. We all relate and learn from each other. ... This is a great place to be. Anybody looking for rehabilitation, this is one place they should come to." Another regular is Savannah McKnuckles of Phoenix, who lost both feet in a pedestrian-truck accident in California. "This gym has so many different machines," she said. "I love to exercise. I talk to the Lord and ask Him to give me strength." WASHINGTON, D.C. -- The Equal Rights Center (ERC), a national non-profit civil rights organization, and the D.C. Office of Human Rights (DCOHR), have launched a multi-faceted campaign to raise awareness around the issue of “visitability.” This campaign is the second part of 2011’s “what is WRONG with these pictures?” campaign. The visitability movement advocates that the design of all new single family homes include minimal accessible features—one no-step entrance, acceptable width doors, and an accessible bathroom on the ground floor—that will allow individuals with disabilities to visit family, friends, and others in their place of residence. Federal law requires some accessibility features in the construction of apartments, condominiums and places of public accommodation, but does not yet address accessibility standards in single-family homes—a substantial portion of the housing market. “Visitable” homes are constructed to ensure that visitors with disabilities can enter the house, move about the ground floor, and have access to a bathroom. These features are much less expensive to include originally than to retrofit later. In 2011, the ERC and DCOHR joined together to establish the, “What is WRONG with these pictures?” campaign. The focus of the 2011 campaign was to give people, both with and without disabilities, a fun and stimulating forum through which to learn more about accessibility. The campaign also provided resources on accessibility, an easy to use complaint form, and testimonials from people with disabilities encountering accessibility barriers in their daily lives. The campaign’s website, www.disabilitygame.org, is an interactive forum centered on a game educating users about the three pillars of visitability as well as the benefits of the visitability movement. The tools presented on the site are part of the ERC’s ongoing initiative to encourage everyone to learn more about accessibility barriers for people with disabilities. The campaign includes a print advertisement campaign in the Washington, D.C. metropolitan region. To view the campaign, visit www.disabilitygame.org. It was a typical night in the life of a teenager in Ishpeming, Mich., a small mining town of about 7,000 people in the state’s Upper Peninsula, exactly the sort of night that Dean Dompierre had always wanted for his son. Eric Dompierre has Down syndrome, which led to his being held back in junior kindergarten and first grade. 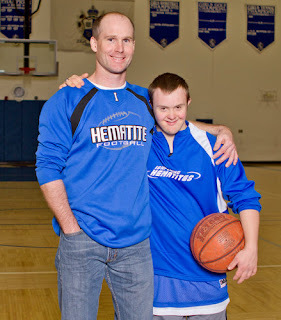 Now Dompierre is a junior at Ishpeming High School, doing well in school and navigating the tricky social hierarchy of the teenage world, in part because of his participation in basketball. He may, however, be prohibited from playing his senior season because the Michigan High School Athletic Association bars anyone who is 19 as of Sept. 1 from participating in sports for that school year. Dompierre turned 19 in January. Whether Eric Dompierre will play again for Ishpeming will be determined by the state association’s 19-member representative council. A majority of the council would have to vote to pass the request on to all of the member schools, who would then vote on the measure. Two-thirds of the schools would need to vote in favor of the amendment for it to pass. John Roberts, the association’s executive director, said the council denied Ishpeming’s first request in December 2010 because it was “too narrow,” with language specifically requesting a waiver for students with Down syndrome. In December 2011, the council denied a second request, which suggested language specific for students with Down syndrome as well as language used by Ohio’s high school association for age-rule exceptions. Roberts said Ishpeming’s second request received “less and less support” as it was discussed during summer and fall meetings last year. China has sentenced disabled human rights lawyer Ni Yulan (pictured) to two years and eight months in prison on charges of causing a disturbance and committing fraud, prompting complaints by rights activists. A Beijing court sentenced the 51-year-old lawyer on April 10. Her husband, Dong Jiqin, was also jailed for two years on similar charges. Both deny the charges, and their supporters say the charges were intended to silence their criticism of the government. The two were arrested a year ago as part of a wider crackdown on political dissent following anonymous online calls for protests in China after a series of uprisings in Arab countries. Sarah Schafer, a Hong Kong-based China researcher with Amnesty International, told VOA the sentence is "absolutely unfair." She charged that Ni Yulan was targeted because she and her husband have been outspoken advocates for victims of land rights violations. "Ni Yulan has suffered countless abuses at the hands of authorities, trying to defend people from forced evictions," she said. "In fact, she herself is a victim of a violent forced eviction, and she began giving aid to other victims to other victims of these types of evictions in 2001." Outside the heavily guarded courtroom in suburban Beijing, European Union official Raphael Droszewski read a statement expressing "deep concern" about the sentences and calling for Ni's immediate release. "The delegation of the European Union in China is deeply concerned by news of the sentence handed down to human rights defenders Ni Yulan and Dong Jiqin," said Droszewski The EU firmly upholds the rights of a person to address any human rights on behalf of individuals or groups, as enshrined in the United Nations declaration on human rights defenders." He also said the EU is "preoccupied with the deterioration of the situation for human rights defenders in China," and will continue to closely monitor such cases. Ni was jailed in 2002 and 2008 for "obstructing official business" and "harming public property" after fighting against the government acquisition of her home in Beijing. She says she was tortured while in prison and is now wheelchair-bound. During her four-hour court hearing in December, Ni was forced to use an oxygen tank and recline on a bed because of poor health. Activists, including Schafer, say the hearing did not meet international standards for a fair trial. Her case is the latest in a series of lengthy prison terms given to Chinese human rights activists and other dissidents. Schafer says she expects the crackdown to widen as China's Communist Party nears the date of a sensitive leadership transition later this year. "As the leadership transition approaches, I think we'll see more arrests, more detentions, more harassment of activists and dissidents," Schafer said. She says Ni's lawyer plans to appeal the verdict, although he has not been allowed to meet with either Ni Yulan or her husband. Ricky Gervais (pictured from the new show) has defended his new Channel 4 programme, Derek, following suggestions he was mocking people with learning difficulties. The one-off comedy is billed as the story of "a simple, vulnerable man working in an old people's home". Some, including fellow comedian Stewart Lee, have said the character makes light of the "mentally handicapped". 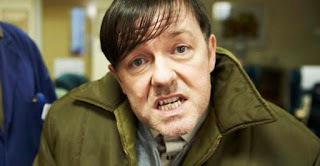 But Gervais, who plays the title role, said Derek was not intended to have a "specific and defined disablity". "Derek is a fictional character and is defined by his creator, me," he told disability rights campaigner Nicky Clark. "If I say I don't mean him to be disabled then that's it. A fictional doctor can't come along and prove me wrong." "He's different. But then so are a lot of people. He's not the smartest tool in the box but he's cleverer than Father Dougal [from Father Ted], and not as different as Mr Bean. "He's based on those people you meet who are on the margins of society. Nerds, loners, under achievers." Gervais was interviewed for Clark's website ahead of the first screening of Derek on 12 April. The campaigner has previously been a vocal critic of the comedian. Last October, she took him to task for repeatedly used the word "mong" on his Twitter feed. She called on the 50-year-old to stop using the term, which can be used offensively in reference to people with Down's Syndrome. "If you find abuse of disabled people sickening, then please don't use the terminology of bullies and thugs," she wrote in The Guardian. The pair eventually made contact, and Gervais asked Clark to watch a pilot episode of Derek. She agreed with his assertions about the story, saying: "I've laughed and cried. I haven't seen cruelty." "Instead of it being a mocking disintegration of a learning-disabled man -paraded for the amusement of comfortable unaffected people, it's the story that really needs to be told at the moment," she wrote on her website. The character of Derek Noakes first appeared in 2001 as part of the Edinburgh show Rubberneckers, several years before the comedian achieved mainstream success with The Office. Stewart Lee made his comments about the character last year, when Gervais announced the Channel 4 programme, and linked to old YouTube footage of Derek. After watching the sketches, Lee said he "imagined feral children trailing real Dereks around supermarkets, chanting 'Derek Derek', as they doubtless would were the series to be made, and wondered if, sometimes, discretion is not the better part of valour". But speaking to Clark, Gervais defended the character, saying it was meant to be sympathetic. "It's important to have compassion for the characters you are portraying because at some level comedy and drama relies on empathy". SARAJEVO, Bosnia-Herzegovina — Two decades ago, young Bosnians worshipped the tall, muscular basketball players who smiled down on them from posters plastered across their rooms. Hardly anyone had heard of the Paralympics back then. Now, 20 years after the bloody Bosnian war erupted, the country's new athletic stars are also tall and muscular, but many are missing a limb. Bosnia's national men's sitting volleyball team is made up of war victims who have turned their personal tragedies into gold medals at international competitions for people with physical disabilities. They are stars that fans welcome at the airport now. "Some see us as such," admitted 42-year-old Asim Medic who says it feels good to be recognized on the street. Sarajevo's basketball players were once Bosnia's stars, especially after a local club Bosna Sarajevo became European champion in 1979. Not now. "Unfortunately, it's us now. The war brought this," Medic said. "People write books about us." Back in 1993, Medic was 23 when one of the hundreds of thousands of artillery shells that landed on Sarajevo ripped his leg off. It felt like the end of life, but part of the rehabilitation doctors recommended was playing sports, especially to fight off depression. The anti-depression sessions turned into serious training, and the rising number of war victims created so many sitting volleyball clubs in Bosnia that leagues could be formed. In 1997, two years after the shooting stopped, the men's national team won its first medal — bronze at the European Championship. Then bronze again at the next World Championship in Iran and finally gold in 1999 at the European Championship in Sarajevo. From then on, it's been rarely anything else but gold. Even after the war, many young people who had stepped on the thousands of mines scattered around the country ended up playing for sitting volleyball clubs, driven by the success of the first generation. The team plans to compete in the London Paralympics from Aug. 29-Sept. 9. "We managed to inspire many people with this problem and made sure they are not left on the street to go on drugs and everything else the street brings," Medic said. Bosnia's 1992-95 war between Muslim Bosniaks, Catholic Croats and Orthodox Serbs left more than 100,000 dead and hundreds of thousands disabled — a lot for a population of 3.5 million. But it also divided the country in two ministates — one for the Serbs, the other shared by Bosniaks and Croats. There are no Bosnian Serbs in the national sitting volleyball team. "It's a pity, as there are many talents among them, but they all have double passports and play for Serbia," said Sabahudin Delalic, the team's captain. Serbia and Bosnia often meet at international competitions, but Serbia has never won a medal. Delalic hopes one day the success of Bosnia's team will attract top Bosnian Serb players. "They claim the time is not right yet," he says, "but our door remains open." Delalic knows what it is to struggle. He had to figure out what to do with himself after he lost a leg in 1992 while a Bosnian soldier. "But I thought, well, I could have been dead," he said. Sitting volleyball changed not only his life but the lives of many others like him. "Our disability means nothing to us any more," he said, noting how good it feels to be stopped in the street by fans offering congratulations. "Six times European champions, one time world champions, one time Paralympic champions," Delalic said. "We have won every competition there is on this planet!" Disability Studies is an emerging academic field which explores disability and society using overlapping perspectives from the social sciences, humanities, science, and the law. The B.A. in Disability Studies offers both a strong foundation in disability theory and history as well as opportunities for in-depth study in one of four concentrations. Graduates from the B.A. in Disability Studies program will be equipped with the knowledge, values, and skills that are sought by agencies providing services to individuals in community programs. Graduates will also be prepared for graduate work in disability studies, social work, rehabilitation counseling, physical and occupational therapy, education, sociology, psychology, anthropology, and liberal studies. •An overall minimum GPA of 2.5. The online application requires students to complete a personal essay question that will help us understand your educational goals and readiness for returning to college. The Sprout Film Festival 2012 will be held on Friday April 27 through Sunday April 29th at the Metropolitan Museum of Art and will be showcasing over 50 films from 13 countries, all related to the field of developmental disabilities. This year, to commemorate the 40th anniversary of the historic Willowbrook: The Last Great Disgrace exposé, Executive Produced by Albert Primo and featuring Geraldo Rivera, the Sprout Film Festival will be screening this film as the festival’s final program (Sunday April 29 at 2:30 pm). We are privileged to have the Executive Producer, Albert Primo, joining us at the festival and giving a talk about his ground-breaking exposé, following the screening. Additionally, we will be presenting Mr. Primo with the Sprout Film Festival Maverick award. The Maverick Award was created to honor an individual who has used the media to improve the lives and image of people with disabilities. The contribution that Mr. Primo has made to improve the lives of those with disabilities has gone well beyond what the flickering light of the projector can ever show. It is an honor to celebrate Al Primo and his invaluable contribution to this field. After this exposé was aired in 1972, the manner of treating people with developmental disabilities was forever changed. If you are not able to join us at the upcoming festival but would like to see Willowbrook: The Last Great Disgrace, you may purchase a stream, download and/or dvd on sproutflix: http://sproutflix.org/content/willowbrook-last-great-disgrace. For a full listing of films available for purchase and to see many free streams and trailers, please visit our website: http://www.sproutflix.org/. The Facebook friends of Pat Figueroa (pictured) report that he died April 3, 2012. You can read or listen to his disability rights oral history at the UC-Berkeley's website on the Disability Rights and Independent Living Movement. Patricio Figueroa, also known as Pat Figueroa, was born in Catano, Puerto Rico on April 20, 1948. Pat was an artist, an author, a disability activist and advocate for people with disabilities, publisher, web designer, an inventor, entrepreneur, husband and father. He was one of ten children of Patricio and Josefina Figueroa. 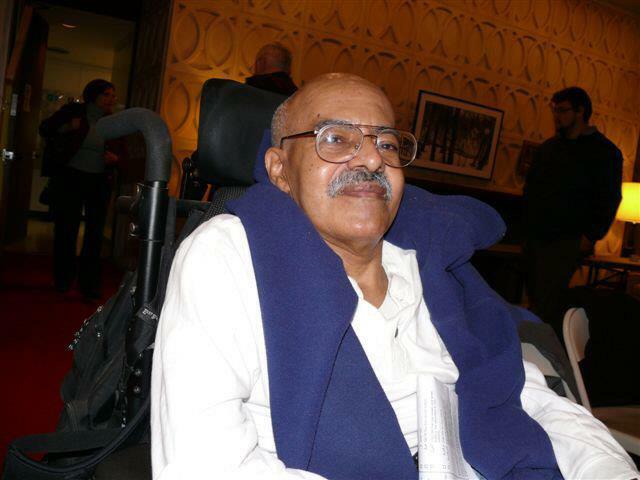 He founded the first independent living center in New York state in 1978, CIDNY, co-founded the 504 Democratic Club, and was the publisher of the national disability newspaper, Independence Today. On November 21, 1980, Pat Figueroa, Jr., and the staffs of CIDNY, BILC, and members of Disabled In Action (DIA), took over the headquarters of the Metropolitan Transportation Authority of the State of New York, trapping then M.T.A. Chairman Richard Ravitch for more than 10 hours. The event got national and international coverage even though John Tesh, then a local reporter for the CBS Channel 6 affiliate, was the only reporter allowed in to speak to the sit-in demonstrators. The disabled activists, all part of a group named Mass-transit Thru Access, blocked the three elevators with wheelchairs, and blocked the doors to the stairwells with heavy desks, filling cabinets, and other heavy items after letting staff members leave down the staircase. Figueroa, the leader and mastermind of the takeover of the MTA headquarters, refused to release Ravitch until he committed to negotiating in good faith with the disability community. Around 7 p.m., the NYC Tactical Squad forced one of the stairwell doors opened and moved in to remove the protesters. All 232 demonstrators were removed; none were arrested. Ravitch was forced to negotiate with the disability community, and eventually lost a lawsuit, under NYS law, that went all the way to the Supreme Court. The Americans with Disabilities Act cites this lawsuit litigated by James Weisman of the Eastern Paralyzed Veterans Association. "Struggling for disability advances has been akin to guerrilla warfare," Figueroa explained, "and at times my tactics had some people labeling me the 'Che Guevara of disability.'" A Vancouver man is alleging that immigration officials discriminate against people with Down syndrome after an application to sponsor his family was denied when authorities ruled his sister would be a burden on the system. Accountant Kevin Patel (pictured center) applied to sponsor the immigration of his parents and 27-year-old sister Aditi from India five years ago, but received a rejection last summer. Immigration Canada explained that Aditi would, "cause excessive demand on health or social services in Canada." Patel said he was "shocked and appalled" by the decision. "For the Canadian government and the visa officers in New Delhi in India to make such a rejection based on their presumptions about Down syndrome is completely unacceptable," he told reporters Friday. Patel said his sister requires no medical care and is completely self-sufficient. "We've provided every evidence there is that we can support her, we are willing to support her, because such a demand has been placed on us by the Canadian government," he said. Don Davies, the NDP MP for Vancouver Kingsway, is calling for the federal government to reverse the decsion. "The only conclusion we can draw is that because she has Down syndrome, she was rendered inadmissible," he said. Under Canadian health care laws, a person with Aditi's IQ of 65 has to receive life skills training, at about $60,000 over five years. According to Immigration Canada, Patel did not provide the requested plan on how he would pay for his sister's needs. An Immigration Canada spokesperson told CTV News that Aditi's parents "claimed they had never received social services in India for their daughter, even though she had received vocational training from a charitable trust." Patels claims his sister's vocational training was paid for, and he saw no need to present immigration authorities with plan to care for her because he believes his income is proof enough. ‘Private Practice’ star and advocate for children with disabilities, Amy Brenneman to keynote 2012 TASH Conference in Long Beach, Calif.
WASHINGTON – TASH, a nonprofit advocate for inclusion and human rights of persons with significant disabilities, announces actress Amy Brenneman will be among keynote speakers during the 2012 TASH Conference in Long Beach, Calif., November 28-December 1, 2012. A 501(c)(3) non-profit organization, TASH is an international grassroots leader in advancing inclusive communities through research, education and advocacy. Founded in 1975, we are a volunteer-driven organization that advocates for human rights and inclusion for people with the most significant disabilities and support needs – those most vulnerable to segregation, abuse, neglect and institutionalization. The inclusive practices we validate through research have been shown to improve outcomes for all people. More information about TASH can be found at http://www.tash.org/. In addition to her current role at Violet on ABC’s Private Practice, Brenneman’s past performances include roles on NYPD Blue and Judging Amy, which Brenneman created, executive produced and starred in for six years. Her roles have garnered critical acclaim and earned multiple Emmy, Golden Globe and Screen Actors Guild award nominations, as well as three TV Guide awards for Best Actress. Find more at http://theamybrenneman.com/. from WXIA-TV in Georgia. This photo by Alex's mother has gone viral. COBB COUNTY, Ga. -- A photo posted on the 11Alive Facebook page has prompted an outpouring of comments. 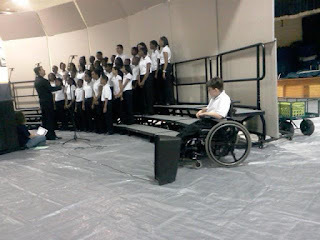 It shows choir members from several six grade schools performing Tuesday night at South Cobb High School, while wheelchair bound Alex Pollard, also a chorus member, was kept way off to the side. Alex's mother, Arla Jan Wilson, said she was just sure someone would roll him up to the group before the music started, but everyone seemed to completely ignore him. "To see the look on his face, it broke my heart. It was totally unacceptable. That should never happen to my child, or any other disabled student out there," said Wilson. Wilson said her 12-year-old son, who is in a wheelchair because of Cerebral Palsy, was so excited to join the chorus after seeing the hit show "Glee". The choir director, Lars Grevstad, is actually Alex's chorus teacher at Cooper Middle School. Wilson said she chose to send Alex to that school because it has accommodations and training for special needs students. It was a regrettable oversight that the student with special needs was not positioned with the rest of his schoolmates during the choral performance. The student has been a member of the chorus for the entire school year and there have been no prior issues. The choral director has cited several reasons why this occurred but accepts responsibility. The matter will be investigated and, if necessary, appropriate personnel action will be taken. That action could include a letter of reprimand and/or sensitivity training. Yet, when 11Alive's Duffie Dixon spoke to the district earlier in the day it acknowledged it had talked to the choir director, Lars Grevstad. According to spokesperson Jay Dillon, among the reasons Grevstad gave was that a student helper usually rolls Alex up to the choir. That student helper was apparently absent. Dillon said Grevstad also unfortunately never saw Alex off to the side. "I find that hard to believe," countered Wilson, "since the director came and welcomed Alex personally before the performance started."